There’s nothing like home-grown steaks, roasts and hamburger! That’s what Kevin and Mindy bestowed upon us the last time we were home! HAPPY! LUCKY! HAPPY!!! Every time I open the freezer I dream of what I should make and if it’s worthy enough of such a gift. Finally, I had to bite the bullet, I couldn’t just keep staring and dreaming. The first recipe I chose was this Texas Chili, isn’t it wonderful when your choices are superior?! This recipe was and IS so worthy. I’ve heard Texans don’t serve their chili with beans of any kind. The chili is just chock full of meat with a lot of accouterments to top it off, including beans. I made it as they told me to, but after tucking into my first bowl and discovering what an ethereal experience it was, I knew I needed to make it last as long as possible and proceeded to “fix me up some beans,” pronto! If you make this recipe, do yourself a favor and make A LOT! If you can possibly hold off eating it for one day while the flavors get even richer, you’ll be happy, but if you can’t wait, at least you’ll have plenty for the next day or two to enjoy. While that’s working go ahead and brown your meat in a large 8-quart Dutch Oven. Over medium-high heat sear until browned and crusty on two sides. Work in batches so you don’t steam the meat. Leave the brown bits in the pan, add more oil if it seems it’s getting too brown and turn down your heat if it seems too hot. 2 Tbsp Ancho Molido Chile Powder – this is important, I think it’s what made this dish sing! Do not substitute regular chile powder, or you will be disappointed! Stir until the spices coat the meat and vegetables. 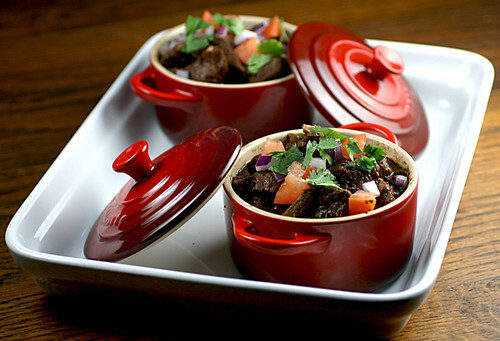 1/4 Cup Wondra or Flour if using flour, mix it in the beef broth before adding it to the chile. Stir well and let simmer partially covered for 3 hours stirring occasionally. Discard Cinnamon sticks and bay leaves before serving. Taste before serving and add more salt if necessary and if it’s not as thick as you’d like it either add more Wondra or take out some cubes of beef and shred them up. Oh my that sounds amazing!!!!! I used to spend a lot of time in Texas and this sounds like a chili we used to get at a local hole in the wall. I used get a giant potato smothered in chili with cheese and diced tomatoes. Where does one find that fancy sounding chili powder? I’d like several bowls while I watch football today, please! Placing my order now so you can drive up in time to serve it to me for the first game. Ha! Nothing better than a hearty bowl of Texas Chili. Nice recipe. We want to invite you to share it on Food Frenzy. It would be a great addition to the site. While there create your own blogger page to direct Food Frenzy visitors back to your blog site. Chock full of goodness!! Love the little ramekins. I have saved this recipe to try. The flavors sound amazing and I have never made a true Texas chili. That looks amazing, so many great ingredients! Oh goodness, this sounds delicious, flavorful, warm, comforting… I’m in love! And then there’s the photo….gorgeous! Hubby’s favourite dish is chili with rice – he’s away for the weekend and guess what he’ll be coming home to?! Only problem is I think the ancho molido chile powder might be tough to find here in the English countryside – I’ll do my best to do justice to your recipe though, even if I do have skip or sub here and there! Yes, it’s true that many Texans say beans shouldn’t be in chili, but take it from this Texan…I’ll darn well fix my chili however I wanna fix it and don’t much care what anyone has to say about it, even my fellow Texans. Found your cornbread recipe via my Foodgawker feed and am going to subscribe. Even though I get hundreds of posts w/ Foodgawker and hundreds more with my other recipe sites, there’s always room for one more (good) recipe website feed! Thanks for subscribing and the laughs!